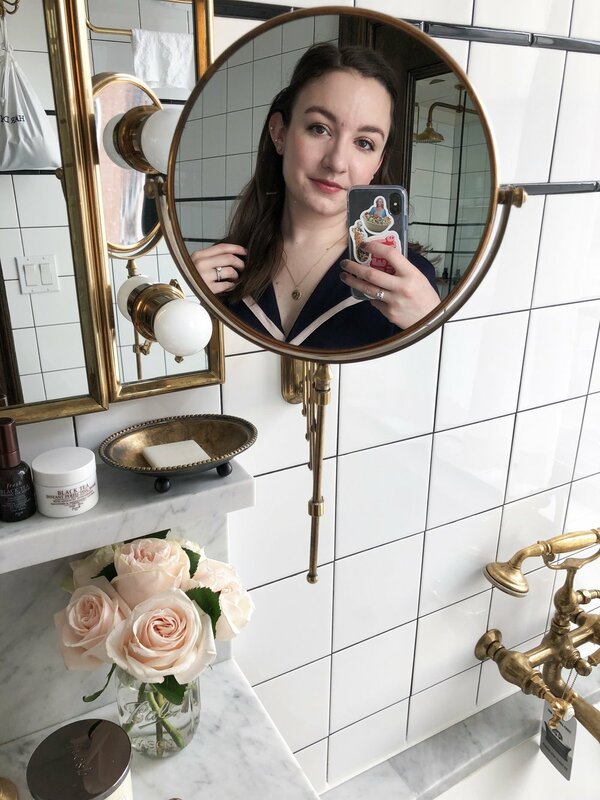 I don't talk much about my haircare routine on the blog, and that's because historically I've pretty much been a mess when it comes to my hair. I just can't really get it to do what I want, so over the years I've simply given up and just let it do what it wants. I have a lot of hair, but it's quite fine, so it tends to get oily and weighed down quickly, while the ends get frizzy and dry. Hair products never really excited me all that much, until I was contacted by Hairstory and read up on the brand. Hairstory is a haircare line and salon started by Michael Gordon, who also founded Bumble and bumble. The whole ethos of the line is to educate people on how shampoo is actually incredibly damaging to your hair, and all the products we use afterward is to correct and hide that damage. It makes sense to me! Hairstory's hero product is the New Wash, quite literally a new way to wash your hair, and their remaining products form a capsule collection that covers any and all bases. For a low-maintenance gal like me, it seemed like a match made in heaven. When Hairstory contacted me, it was to take part in their campaign #TakeAShowerWithUs, where you would replace your regular shampoo and conditioner with New Wash for 30 days - I dedicated myself to this and replaced all my other usual hair products with Hairstory's line, too. After a month, I couldn't be happier and can't see myself switching back anytime soon. The New Wash* is their revolutionary way to clean hair - rather than using detergents, it cleans the hair with aloe and essential oils. As you can probably imagine, it smells amazing. It feels like a a conditioner right from the pump, and if you're used to using shampoos that lather up like I was, it'll be a bit of a learning experience. I've found the perfect amount to use for my hair is about 4-5 pumps. You slather it through your hair and spend some time massaging it into your scalp. It doesn't really feel like there's much in your hair at this point, but it's amazing once you rinse it out - it immediately feels like you've already used conditioner. With the New Wash, there's no need for conditioner or masks. My hair went through a little adjustment period with this - it wasn't used to being cleaned so gently, so it was a little oily for my first few washes. But after sticking it out, I couldn't be happier. My hair feels so healthy and soft, and it really brings out its natural wave and texture. I was super intrigued by the Hair Balm* because it's a leave-in product to tame frizz and enhance texture, and it's meant to be used when airdrying your hair. That's pretty much the only thing I do to my hair, so this was right up my alley. This really brought out my waves, and it even turned them more into curls. I've never been comfortable wearing my hair down right after washing it, but the Hair Balm turned it into my ideal messy-ish waves with no frizz or puffiness. I love a good texturizing spray, and Undressed* is now my new favorite. It doesn't leave my hair crispy, weighed-down, or sticky, which are problems I often had with other texturizing sprays. This can be used on wet or dry hair, so I usually spray a bit in my roots after I've just washed my hair, and I'll spray a bit more through the lengths on my second-day hair. I've tried using salt sprays that just dry my hair out, but this doesn't at all. My hair is getting quite long, so it can easily weigh itself down and flatten out at my roots while air drying, but spraying this through the roots really helps them stay lifted and gives great volume without being too much. The last product I got around to trying, but the one styling product that's become my favorite, is Dressed Up. * It's meant to create body and control in the hair, usually when blowdrying. It's a super lightweight lotion texture that spreads through the hair easily. I usually avoid blowdrying my hair as it just puffs up and gets tangled, but using the Dressed Up cream really helped - even with my mediocre blowout skills, my hair didn't end up a huge mess and looked like I knew what I was doing. I've even been using this when I airdry my hair, as it's more lightweight than the Hair Balm, and it works just as well - it doesn't create as much texture as the Hair Balm does, giving it more body and movement instead. I'm over the moon and totally in love with all four products, and I'm already calculating when I'll need to order a new New Wash. I'm completely converted. Have you tried any products from Hairstory before? *I was very kindly sent all four Hairstory products, but all opinions are my own. This is not a sponsored post. Please see my disclaimer for more information.